Often, especially when I am travelling overseas, when I tell people what I do for a living, people want to know how much it would cost to go to Thailand for a golf vacation. While difficult to generalize, there are 5 main questions that need to be answered to determine the cost of a golf holiday in Thailand..
1. What standard of accommodation do you wish to stay in? You can stay in the most desirable and exclusive property in Phuket, the Amanpuri, at around US$1,000 per night. At the other end of the scale, a clean and comfortable room in a nice 3-star hotel can cost as little as US$30 per night. There are literally thousands of hotels at every rate in between. 2. What time of the year do you intend on visiting? There is a three-tier pricing system for many of the hotels in the main resorts. Low season is mid-April to end October. High season is the beginning of November to mid-December, and the beginning of February to mid-April, and Peak season is mid-December to end January. Note that for High season early booking is recommended. For Peak season, early booking is essential – virtually all of the hotels are fully booked very quickly. At Christmas, New Year and Chinese New Year many of the hotels have compulsory Gala Dinners, which must be factored into a holiday cost. 3. How many people are there in your group? Hotels in Thailand generally charge per room so, clearly, if you are travelling on your own, it is more expensive than sharing a room. There are also often single supplements for such things as transportation. By the way, many golf courses do not allow singletons, but your Thailand golf travel agent can usually arrange for you to join up with other golfers of similar standard to yourself. Discounts are usually offered to larger groups for accommodation, transportation and golf, especially if your group comprises over 16 persons. 4. Where do you want to play golf? Again in Phuket, which seems to have extremes in rates, a day’s golf at Blue Canyon can cost you over US$200, whilst just down the road at Thai Muang, you can expect to pay only 25% of that. 5. Do you want your Thailand golf agent to organise a golf tournament on your behalf? Do you want golf tuition during your stay, or a golf pro to join your group? Do you want leisure activities arranged on your days off from golf? All these things are no problem but, obviously, do cost. For a group of four, twin-sharing room in 5-star accommodation for one week in March, with four rounds of golf at top championship courses, a ball park figure would be US$1000 per person, inclusive of breakfast, all transfers, and taxes. For a group of sixteen golfers, staying in single rooms in 3-star accommodation for two weeks at the same time of the year, with eight rounds of golf at good standard courses, the figure would be US$1200 per person. 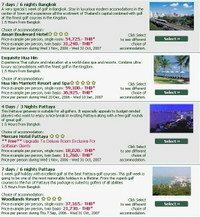 These are just 2 examples of the many package variations that are possible, but hopefully it gives you a feel for Thailand golf vacation costs. Of course if you are interested in a package you can inquire with any agent, locally or online, or if you prefer just drop me an email and I will gladly put together a customized package to meet any requirements you may have.